Hawksley Workman's new album Old Cheetah (out now on Six Shooter Records) includes a track called "Small Town Dracula," and we're only giving you one guess about what the accompanying music video depicts. 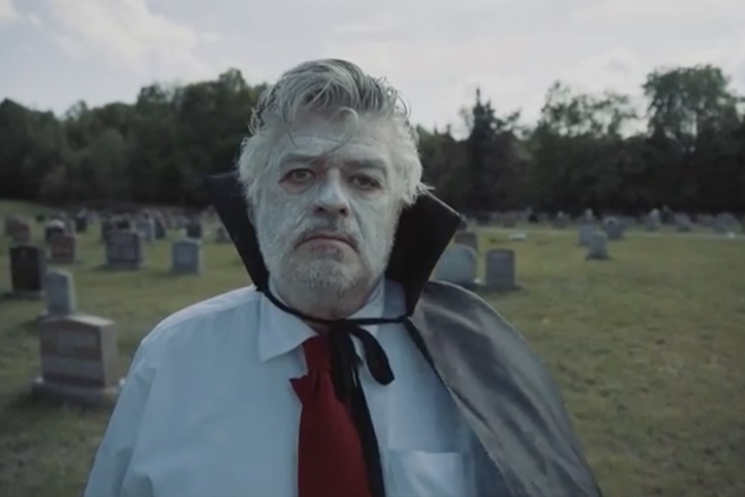 The clip for this theatrical cabaret rock number takes a very literal approach to the subject matter by showing a middle-aged vampire going about his mundane life in a small town. He wanders around a graveyard, goes shopping at the supermarket, bowls a few rounds, and even washes his cape at the laundromat. He seems a bit lonely, but he eventually meets a young Dracula he can relate to. As the song reaches a wild crescendo, our hero finds himself in a rather bad state in the forest. Filming took place in the Ontario towns of Burk's Falls and Katrine. It was directed by Antler & Power, which is an alias for Workman and Mounties bandmate Steve Bays (also of Hot Hot Heat and Fur Trade). Watch it below [via CBC].